Here I am sharing my thoughts, tips and tricks all around baby care I learned in nurse school, while I worked as a pediatric nurse in Germany, and until now. Home remidies can work really well but if it's not better in a few days, or you have a serious condition, please ask your doctor. With the cold weather, the room air is often very dry. 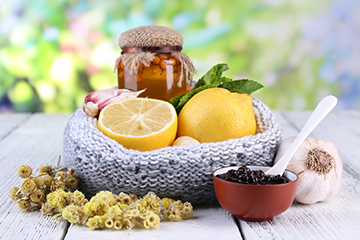 It can cause some trouble with breathing and is definitely not helpful for an already congested nose. What helps is to air the room for 5 minutes, at least twice a day. You can also put a pot of water on your heater (if it’s safe), hang a wet towel in your room, or use a humidifier. GO OUTSIDE! Fresh air is the best to help the immune system and good for respiratory issues. Wrap you and your baby in warm clothes. Don’t forget the hat and cover the ears. Carry your baby close to you, facing you so the air won’t be too cold. Bring something to block wind but better try to avoid windy areas. Meditation is a wonderful way to spend time with yourself and train your consciousness. Being present in the moment with yourself and your baby helps you to be the best mom (dad) you can be and also to enjoy this wonderful time which goes by so fast. There are many classes and apps which can help you with meditating and you can learn a lot about the mind. This knowledge is also great and helpful to teach children's. I use the Headspace app which I really like. To help a baby with gas and stomach discomfort, there are many things you can do. First, try to prevent- check feeding position. Try to keep the baby's head higher than her stomach. Burp your baby during and after nursing. If you breastfeed, your baby could have trouble digesting some of the foods that you eat, which can come through your breast milk. This could be dairy products, caffeine or other things- watch what you eat and see what happens. If you feed formula, thinking about switching brands. If you feed formula, you can replace the water with herbal Tea. Fennel seeds, caraway, anise, and chamomile can be very effective. The safest way for the baby is buying seeds, crush it with a mortar and brew it with boiling water. A rule of thumb is not to give more than two cups of tea a day, not longer than 3 days in a row of one herbal tea. And don't forget, it is totally normal that babies have gas, you can help to handle it with a gentle belly massage - clockwise around the belly button. Pump the babies legs back and forth (like riding a bike) while she is on her back, or give her tummy time ( always watch the baby while lying on the belly! ). And my favorite - a warm cherry pit pillow, warm water bottle or a potato heat wrap. Just make sure that it is not too warm (try it out on the inside of your arm for a minute). 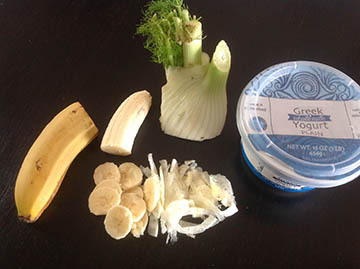 Fennel-Banana Salad. This is my favorite recipe with fennel. It may sound like a weird combination, but it taste really good and it is super healthy with lots of vitamin C, potassium, calcium, and magnesium. Fennel is also known for its healing power. You need 1/2 fennel, 1 banana, 2-3 Tbs greek yogurt, and some lemon or orange juice. Cut fennel (including leaves) and banana very thin, add yogurt and juice and mix everything together. You may need some water for easier mixing. Done! Infant handling and Kinesiology was something I was interested from the beginning of my career as a pediatric nurse. A newborn baby seems so fragile. With the right handling, you can support the baby in development and well-being. When you pick up a baby from a flat surface, roll it first on your hand so the head is on the side or to the front. Always support the head so it is not falling to the back. The rolling or cycling is also a Feldenkrais theory, which is all about movement. For the diaper change, it is also good to roll instead of just pulling up the legs, which is not very supporting for the development of the hip joints. The rolling will be the first movement a baby is learning, so if you do it in a daily routine, it will definitely support your baby. Good sleep is important for mother and baby. I was very confused when I saw how empty the baby beds are set up here in the US. As a pediatric nurse in Germany, we learned that a baby coming out of a belly with all mommy around it, that nesting is a great way to make the baby feels safe and cozy. Of course, you have to make sure that nothing can block the airways, and that they can not overheat, which are possible causes of sudden infant death. Ask someone who is trained in bedding to get tips how to do it right. Also never use sheepskin in a baby bed or stroller, it blocks the heat and it can be dangerous for babies. I didn't know that there are many things different in baby care here in the US. To do swaddling on a regular basis is one of the things that was new for me. If you are interested, I am happy to share how I learned to help the baby to calm down. In my training as a pediatric nurse, we especially focused on understanding how a baby feels, and to be able to see what is going on inside them. With my experience, I can give you many ideas and maybe a different point of view. This can help you to develop your own parenting style. Upset stomach and nausea are gastrointestinal complaints that many people deal with sometimes. Stress, hormones, little sleep, poor diet and processed food can be the reason for it. Carrot or pumpkin soup can be a great food to eat during a time of weak digestion. Just cook it for at least an hour, or half an hour in you pressure cooker, then blend it with water and add some sea salt. If it doesn't go away within a few days, please call your doctor. a little bit. You will see, it does make a difference.